The first Chatham Rotary Club meeting of the new year was highlighted by a presentation by Paul Nicholson, incoming President for Rotary 2017-2018. 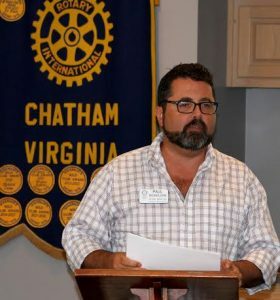 Paul began his program by announcing that Chatham Rotary Club had been awarded two Matching Grants by District 7570 for projects to be completed by our club working in conjunction with other District 7570 clubs from Danville. One grant is to support the Pittsylvania County Pet Center which just opened in Chatham this month. The other Matching Grant is for improvements on Elba Park in Gretna. Both grants involve Chatham Partnering with Danville Rotary Clubs in completing the projects. Paul then introduced himself to the club members with some of his background, strengths, and weaknesses. He then went on to stress his emphasis on two significant factors: Be Authentic and Tell it Like it is! He followed this introduction with a summary of his objectives for the coming year for the Club. Directors: Rachel Gatewood, Alvin Crider, Robert Adams and Will Scott. The meeting ended with the drawing for the Queens Pot with Phil Mauger winning the Kitty but no luck on the Queens Pot. Twenty five Cards remain for next week.